Audiences are usually willing to suspend disbelief for whiskey decanters filled with tea or beer bottles containing diluted coca-cola, but the working-class youths in Ecstasy, Mike Leigh's time-capsule portrait of England in 1979, also consume copious quantities of tobacco, a substance nowadays inspiring such alarm—despite its legal status and widespread popularity in the United States—that special care must be taken, lest playgoers in the close quarters of the Red Orchid theater become distressed at their proximity to the botanical surpassing even marijuana as heir to the epithet "evil weed." Many directors choose to adopt the simple remedy of excising all stage business associated with smoking, but sometimes the rituals engendered by centuries of nicotine ingestion are essential to the story (does anyone remember Jean Kerr's romantic comedy, Mary, Mary?). Fortunately, several facsimile products for simulating smoking are available to theater technicians. 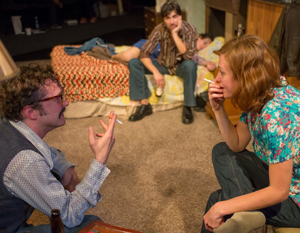 "According to the script, there are twenty-seven cigarettes smoked throughout the play," sighs Allison Raynes, Cole Theatre's property designer, "They are all extinguished or left in ashtrays onstage—we have four of those scattered around the stage, even though the set is cluttered with furniture—so none of them can be used again for another scene." Whether cigarette, pipe or cigar, the dramatic function of smoking lies in a character's manner of igniting the instrument of choice and the initial "drag" thereon. After that, they only serve to encumber the smoker's hands. Did the actors require rehearsal in the management of these once ubiquitous, but now nearly-obsolete, trifles? "Everyone caught on right away to the lighting and holding part, but sometimes I had to remind them to use the ashtrays, and not tap off the ashes wherever they pleased. If those had been real cigarettes, the carpet would have been littered with burn marks!" What do the actors smoke, anyway? The new water-vapor electronic cigarettes (proclaimed by theaters to be the greatest invention since Velcro), perhaps? Raynes sighs again, "E-cigarettes would probably have been the best, but our budget didn't permit it. We considered the herbal facsimiles, which behave like the real thing, but contain no addictive ingredients. [Director] Shade [Murray], however, was concerned about large quantities of smoke—of any kind—drying out the actors' throats." So what did you decide on? "The actors smoke 'puff cigarettes' that you buy at Party shops or Halloween Costume outlets. They are tubes filled with an odorless talcum powder that looks like smoke—the 'lit' part is high-reflective red-orange foil—when you blow into the 'filter' end to push it out through the tip. We have thirty, altogether, which we recycle from one night to the next." She smiles wryly, "The downside is that I have to test each cigarette before every performance to make sure it has enough powder inside—if it doesn't, I have to remove its innards and refill it. That can take a lot of time, even if the payoff is worth it." Our society has become so phobic about the whole concept of toxic fumes that even birthday cakes are regarded as suspect. Have you experienced audience members unnerved by the mere sight of the fake smoke? "In other shows, we've had patrons indulge in fits of very loud, noisy coughing—the put-that-out-you're-making-me-sick kind." admits Raynes, "We haven't had any of that this time, though, because they realize right away that there's no danger." 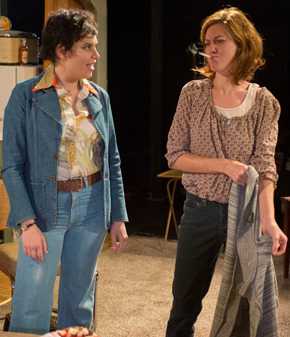 Ecstasy runs at Red Orchid Theater through September 28.